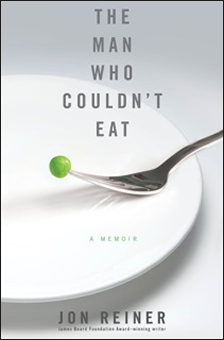 The months during which "foodie" Reiner was not allowed to eat anything by mouth, in a last-ditch effort to preserve his guts from the gruesome ravages of Crohn's disease, seem to last for years in this memoir of illness and food obsession. A Memoir by Jon Reiner is a disturbing, horrific and appetite-suppressing chronicle of his Crohn’s disease and the resultant torn intestine which leads to him getting all of his nutrition intravenously. Until Crohn’s disease interfered, Jon Reiner had been an enthusiastic eater; his passion for all kinds of food is clear in the flashbacks in which he lovingly describes his favorite meals and his family’s jaunts to Manhattan delis to purchase just the right kind of smoked meat and the perfect blintzes when he was a child. "Reiner's food writing is mouth-wateringly delicious. A compelling story of triumph over adversity." “Reiner has the moxie and the courage not only to tell the harrowingly real story of his fight to stay alive, but to do so with detachment and a crazy sense of irony. Let me tell you -- Jon Reiner's The Man Who Couldn't Eat is genius. Reiner is a wonderful writer whose ability to describe his own experiences makes for a beautiful read. What an interesting read. After reading the book, I am still asking myself questions. How often does my day center around food? How many times a week do I schedule visits with friends and family where food is the main decision? "Takes you behind the scenes of a family that as a whole must overcome this disease and learn to live a life without food as a center." The Man Who Couldn't Eat describes life with a chronic disease in a straight-forward way. Diagnosed with Crohn's disease, and it's completely devastating impact on his body, Mr. Reiner has to come to terms with limitations so severe that most of us could not even envision facing them, not to mention the impact on his family and relationship to the world. The first chapter opens with a medical crisis and engrosses you, as you travel through Mr. Reiner's life as he grapples to deal with his "new normal," and not always in the most gracious of ways. "A story of pain, isolation, and ultimately, redemption." Have you ever thought about what it would be like to not be able to eat or drink? Not to fast, not to go without food for 30 hours in support of starving people in Africa, but to really go with nothing passing down your esophagus for longer than a week or two? "His insight is phenomenal. It is a contrast between food love and food hate that exists in such extremes that it is truly mesmerizing."